Just past Casa Mojanda on the road up to Lagunas de Mojanda is the well-signposted trailhead for Cascada de Taxopamba. It's about a half-hour walk to these pretty falls and lagoon in a beautifully pristine setting. The jump is formed by the waters coming down from the moors of Mojanda. The top of the waterfall has a height of 45 meters and where a jump has an area of 500 square meters, although the cause of the water is six meters wide. Travelers flock to this jump for the force and charm of its landscape are unique. Around the waterfall there a flora and fauna of the moor and small farmers who are very friendly and hospitable. This a spectacularly beautiful canyon with different altitude and waterfalls full of lush vegetation. The Taxopamba Waterfall is another tourist spot Otavalo which is 4 km,on the route to the Mojanda lakes, there is a detour to visit and recreate in this beautiful waterfall with a 20 minute walk from the main road . 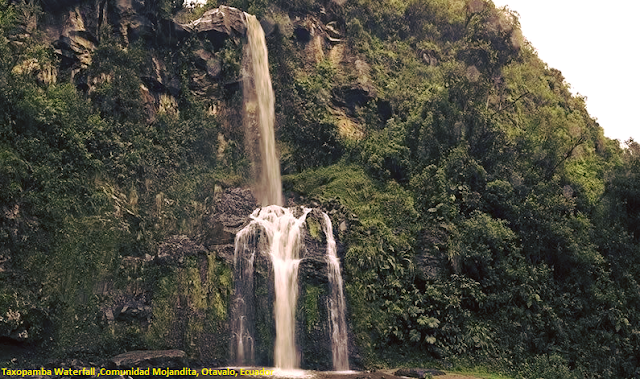 South of the city of Otavalo, along the road to Lake Mojanda is sighted a waterfall, whose strength and mineral properties have been attributed miraculous.